NEW Attorney-General George Brandis clearly doesn't like being called a hypocrite. Come to think of it, who does? But if the cap fits, sometimes you've just got to wear it, as uncomfortable as that may be. Last Saturday in this column I accused Brandis and former Labor attorney-general Mark Dreyfus of hypocrisy over comments that each made about one another's appointments to the Australian Human Rights Commission. Brandis recently appointed Tim Wilson - a member of the Liberal Party and well-known right-wing spruiker - despite in July having attacked Labor's appointment of Tim Soutphommasane, a member of the Labor Party and well-known left-wing spruiker. Brandis described Soutphommasane as an "overt partisan of the Labor Party", saying that commissioners must be able to "discharge their responsibilities in the human rights field in a non-partisan manner". I would have thought it was an open-and-shut case of hypocrisy, but Brandis disagreed, writing to this paper to explain why. His letter was published on Monday. The argument Brandis mounted to counter my claim that Wilson was a partisan appointment was that while Wilson "may have been a longstanding member of the Liberal Party", "in his contributions to public debate he has been anything but a Liberal Party partisan". The example Brandis used to highlight this point was Wilson's public criticisms of the anti-bikie laws in Queensland. "We were not looking for a partisan, and we have not appointed one," Brandis boldly declared with the final sentence of his letter. Brandis's argument had two unintended consequences: first, it highlighted that he actually doesn't understand the definition of a partisan; second, even the incorrect definition Brandis offered up doesn't absolve him of the charge of hypocrisy. In fact, it cements it, as I'll explain. Brandis is extremely well read. Certainly his library (exposed by this newspaper not that long ago as paid for by the taxpayer, via entitlements) is littered with political and philosophical texts. I have no problem with Brandis expensing his library, incidentally; it is nice to see a politician who surrounds himself with books, a rare sight to be sure. But Brandis, if he reads them, would know full well what being a partisan actually means. A partisan is someone who supports one side of politics, period. It doesn't mean becoming a drone who can't think for oneself and backs every single element of a party's agenda, and that is not what I was accusing Wilson of being, incidentally (nor Soutphommasane, who is also a partisan, according to the true definition). A person doesn't cease to be a partisan just because they occasionally (in Wilson's case, very occasionally) disagree with their party's policies. The correct term for someone who never holds views that differ from their political party of choice, no matter what, is a sycophant (although sycophant isn't a formal political-science term in the way that partisan is). But even if we put to one side Brandis's misuse of what it means to be a partisan and accept his assertion that Wilson is not one, what about the fact Soutphommasane has bucked his party's line on numerous occasions? 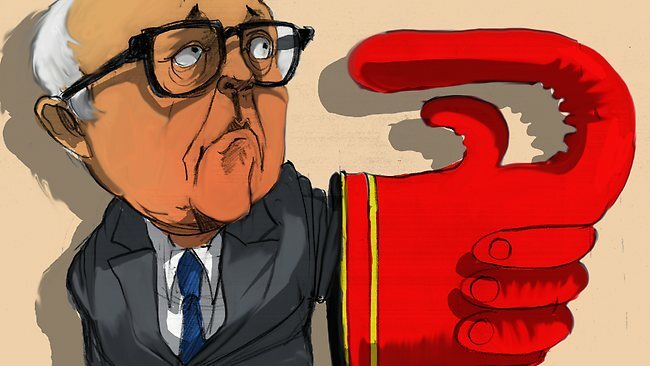 Why did Brandis see fit to call him an "overt partisan"? Soutphommasane has challenged Labor over its treatment of boatpeople, its backtracking from support for a big Australia and limits on the humanitarian refugee intake. He even wrote a book titled Don't Go Back to Where You Came From, which challenges his former boss Bob Carr's thesis that immigration numbers should be reduced. He has challenged Labor many more times than Wilson has challenged the Liberals. How can it be that Soutphommasane has done all of that, yet Brandis saw fit to accuse him of being an "overt partisan of the Labor Party", unable to "discharge (his) responsibilities in the human rights field in a non-partisan manner", given the definition of partisanship Brandis wishes to work with? All the more so given that Soutphommasane was appointed to the position of race discrimination commissioner, thereby putting him in direct conflict with Labor on the issues on which he has disagreed with it previously? This is in contrast to Wilson, who is in lock-step with the government on the repeal of section 18C of the Racial Discrimination Act, the first significant issue Wilson as a commissioner will be asked to look into. If Brandis believes Wilson's occasional public disagreements with Liberal Party policy absolve him of the charge of being a partisan, why not Soutphommasane for his many public disagreements with Labor? Brandis went out of his way in July to describe Soutphommasane as - in effect - a partisan sycophant unable to live up to the needs of the AHRC. Then he invented a new meaning of the word partisan to insulate Wilson (and himself) from the same criticisms he dished out to Soutphommasane and Dreyfus less than six months ago. As I wrote last week, by all means condemn a partisan appointment by your political opponents, but don't then make one yourself. And by all means make partisan appointments, but for God's sake shut up when your opponents do likewise. Brandis's letter has invited me to point out a few home truths missed in last weekend's column now that I have revisited this topic. While I charged both Dreyfus and Brandis with hypocrisy last week, clearly the greater hypocrisy was on Brandis's part. His criticisms were far more over the top than Dreyfus's. Dreyfus (unlike others on the Left) deliberately avoided attacking Wilson for his Liberal Party membership, whereas Soutphommasane's Labor membership was at the heart of Brandis's attacks. Further, while I believe an AHRC with more balanced representation is a good thing (if it isn't abolished to the tune of a $25 million saving each year), and Wilson's appointment assists with achieving that, the process Brandis followed ahead of selecting Wilson was appalling. Not only did he announce the appointment before it was confirmed by the Governor-General, he also chose Wilson without a selection process (which Soutphommasane went through) and without even bothering to inform the president of the AHRC, Gillian Triggs, much less consult her.